VTEL MEA is a multinational, regional telecommunications leader, driven by a sharp focus on emerging technologies and promising markets. The company was established in October 2011, at the DIFC in Dubai – UAE, with an authorized capital of USD 280 million. 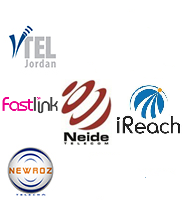 Boasting world-class telecommunication infrastructures throughout the Middle East and Africa, the company comprises reputable, established subsidiaries that include VTEL Jordan, Africell, Newroz Telecom, Neidi, Fastlink, iReach, as well as managing the operations of Itisaluna; each of these are an expression of VTEL MEA’s endeavor to consistently reward shareholders and clients through acquiring unique business prospects. The company is taking strides in becoming one of the largest, most proactive contributors in the region, concentrating on broadband services through cutting-edge wireless technologies such as CDMA200/EVDO, WiMax, GSM/GPRS, 3G/HSDPA and LTE. VTEL MEA takes pride in its key differentiators, which are defined by distinctive telecom knowledge, financial strength, an insightful market perspective, and a clear vision of how to drive new revenues, while minimizing complexity and cost. In seeking alliances with strong entrepreneurs and vendors, the company aspires to multiply its strategic partnerships with local ventures in countries that demonstrate growth potential, and in markets that are ripe for cutting edge, world-class technologies. With its exclusive managerial team, along with the paramount aptitude of its shareholders, VTEL MEA is ready to thrust the organic expansion of its geographical and branching horizons, as it plays an enriching role in telecommunication breakthroughs.